We met another traveling family at our favorite campground (Walmart)! 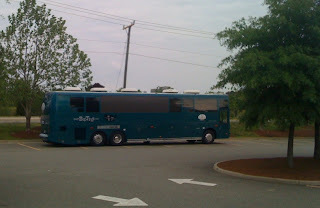 We pulled in for a quick overnight in Williamsburg and met the Igel family from OurBigTrip.us! We'd emailed back and forth with them them back in the summer on the west coast, but just missed them in San Francisco. We didn't even know they were in the area, so it was a fun chance meeting in the parking lot. They're on a year-long trip and are such a fun family. 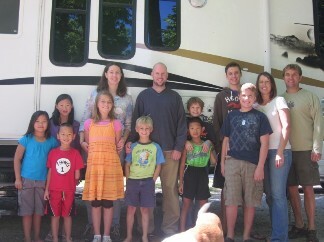 They have 7 kids (4 adopted, so we had much in common), and the coolest bus/RV with plenty of room for a family of 9! you are coming to Maine!? I live in Maine! Any specific area? Going up to Bar Harbor? Definitely climb the beehive in Acadia. Lots of fun stuff to do in Portland as well if you can be there on the first friday of the month all the galleries are open and the museum is free! Cape Elizabeth is wonderful too.